The VIP of this story would have to be Fornell's nasty nasty feet. I mean, didn't they just take your breath away? There's lots to talk about so let's get started. NCIS Season 13 Episode 23 continued the story of the hunt for Jacob Scott. It began with Fornell being rushed to the hospital with three gunshot wounds, and Tony arriving home from Russia without having caught Scott. We learned that the rogue assassin was actually Trent Kort, and that Jacob Scott had not only been framed for the murders, but also for the intelligence leak back in 2002, during which his wife was killed. This explains why we never actually saw Scott shoot Fornell or Jessica Terdei. I mean, why keep the shooter in the shadows when we've already seen Scott earlier in NCIS Season 13 Episode 22? We also learned the identity of the NCIS mole. Usually when there's a mole involved in a story, it's someone we know. That wasn't the case here though, as we've never met former NCIS Special Agent Allen Kane before. I'm not sure I bought that move Tess Monroe played on Kane, when she sidled up close to him in interrogation. It's obvious she was making him uncomfortable by using her sexual wiles but....it just didn't ring true. Speaking of Tess Monroe: she sure is an interesting character! It's early yet, but I think she's going to make a great addition to the team. She's very smart, pulls no punches, is opinionated and doesn't look like she's going to bow to Gibbs in any way. Her pre-empting of Gibbs in interrogation was explainable the first time, not so much the second. She may also have some boundary issues, especially given her dogged determination to obtain Gibbs' profile from the ever-meek Palmer. The other addition to the team (though truth to tell: neither of them have been offered a spot on NCIS just yet) was intriguing too. Clayton Reeves hasn't had as much of a chance to display his character as forcefully as Monroe. He'll probably need a bit more time. The major bummer about this episode was that we didn't get any hints at all about Tony's pending departure from NCIS. Other than what might be the obvious one: the explosion in Israel, and Kort's hunt for Ziva. The expectation was that Tony was going to ruminate about his future and what he was doing with his life. I mean, that dynamic has been forming throughout the season here and there. But we didn't see a hint of it in this story. That means the entire leave-taking – along with all the thoughts behind it – will happen next week, when the season wraps up. That is certainly not the directive one would expect from the team leader of NCIS. You don't go around talking about how you're going to kill someone, no matter how great the tension. About 90% of the time, the bad guy is someone we'd never expect. For at least the second time in this show, the writers fooled us. When we saw that Kort was in the house where Dresser was found dead, there was at least room for a momentary thought that maybe he did it; maybe he killed the man. Then we dismissed that thought because no way is the likeliest sketchy guy the one who did it. Except.....he did. I did not see that coming at all. So now the team's on the hunt for Kort, and it looks as though they're going to Israel to do it. Oh, and no one can raise Ziva on the phone, and her dad's farmhouse has been blown up. What does it all mean? 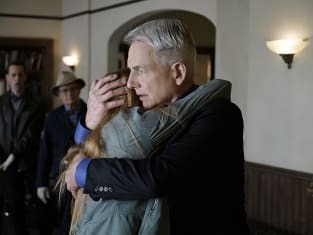 Guess we'll have a week to speculate, since even the promo for NCIS Season 13 Episode 24 gave us no clues about that, or about how Tony's going to make his exit. Even though she was highly stressed, it was great to see Emily Fornell again. She chewed up every scene was she in, including the horribe one featuring Fornell's disgusting feet. The writers certainly have been consistent with Palmer throughout NCIS Season 13, haven't they? He's still playing the clown, right through to the end. When Tony shoved Kort, you could tell both were ready to mix it up. I'm disappointed that they didn't. Abby and Gibbs holding hands with a skeleton for a prayer circle: not cute, not funny, just weird and awkward. As always, you can catch up on missed episodes when you watch NCIS online. What are your thoughts on the penultimate season episode? Did you suspect Kort was the bad guy? What's your take on Monroe and Reeves? Hit us up in the comments!